Chagas disease is transmitted by insects infected with the parasite Trypanosoma cruzi. Chagas disease is also known as American trypanosomiasis, as only triatomine bugs in the Americas (mostly rural, impoverished areas of Mexico, Central America, and South America) carry the parasite. Triatomine bugs pass T. cruzi in their feces. After biting a human, typically during the night and on the face, the insect defecates. If feces enters the body through a mucous membrane or break in the skin, the person can become infected. There are two phases of Chagas disease: an acute phase and a chronic phase. The acute phase occurs weeks to months after infection and, without treatment, the chronic phase persists for decades or for life. Both phases can range from asymptomatic to life-threatening. We have established a Chagas disease model in mice in which animals are challenged with Trypanosoma cruzi via intraperitoneal (IP) injection. Test articles may be administered via oral gavage (PO), or subcutaneous (SC), intravenous (IV) or intraperitoneal (IP) injection. Each study parameter (animal strain, comparator(s), and dosing schedule) can be customized to meet client needs. 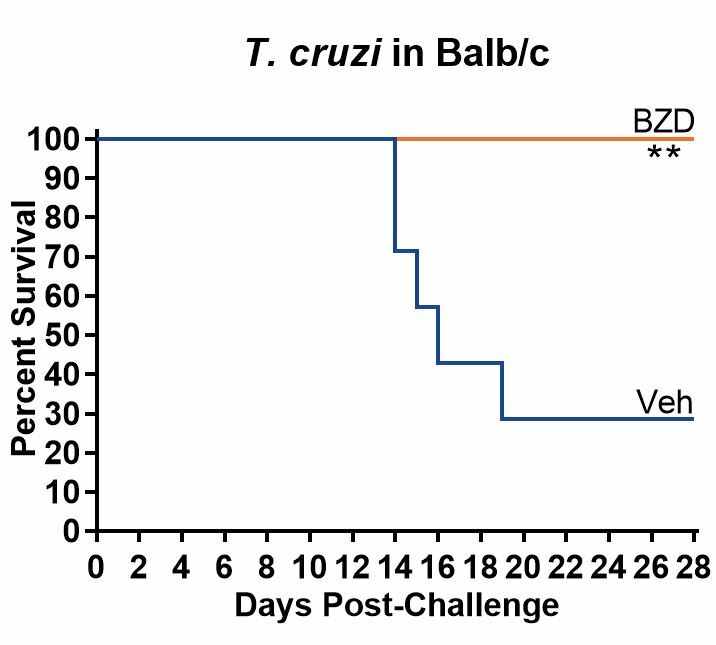 TransPharm has validated a Chagas disease model using the Tulahuen strain of Trypanosoma cruzi.